Just Call Me Chaviva: Ask Chaviva Anything! : Gluten Free and Vegan?! why do you want to go vegan? and why do you eat gluten-free? do you suffer from celiac disease? I deleted my other blogs where I highlighted my gluten-free diet and product reviews, although I kind of regret that now. But the more I live in Colorado and the more I evaluate my diet, the less I buy processed foods meant for review anyway. In a simple answer: I'm taking a holistic approach to health. It includes mental, emotional, physical, and although we live in a world where we attack symptoms instead of the whole body, we often screw ourselves over on finding the right answer to feeling better. I'm also taking a very thoughtful, conscious approach to what I put in my mouth. I give you a story. Rabbi Benzion of Bobov was strolling with a disciple, deeply engrossed in scholarly conversation. As they passed a tree, the student mindlessly pulled off a leaf and unconsciously shredded it into pieces. Rabbi Benzion stopped abruptly. The student, startled, asked what was wrong. In response, the rabbi asked him why he had picked the leaf off of the tree. The disciple, taken aback, could think of no response. The rabbi explained that all of nature -- birds, trees, even every blade of grass -- everything that God created in this world, sings its own form of praise to its Creator. If they should be needed for food and sustenance, they are ingested and become part of the song of the higher species. But to pull a leaf off a tree for no purpose at all is to wastefully silence its song, giving it no recourse, as it were, to join any other instrument in the symphony of nature. So let's begin. The personal reason: A vegan diet keeps all the things that cause me lots of gastrointestinal pain and frustration. The first among those is gluten, of course, but that doesn't have much to do with a vegan diet. Dairy, on the other hand, has a huge conflict with a vegan lifestyle and, as I've mentioned in the past, dairy and I don't get along. Up until I turned 25, I could eat anything without any problem. My father used to warn me that it'd "catch up" with me, and it did. It's really weird how it all started at 25, but it did. Suddenly milk and ice cream and cheese and soy started to bother me. Then gluten became the obvious culprit, and I gave it up but kept eating dairy. Dairy contributes to a lot of problems for me, beyond the gastro issues, including fatigue and these little skin issues on my face called milia that are calcium deposits. I can see a difference in my skin overall when I avoid dairy -- my eczema doesn't flare up and my face is clear. (Note: I still eat eggs, but I don't keep them at home.) When it comes to meat, I feel weighed down and fatigued when I eat meat of any kind -- my body just doesn't enjoy it. Then there are the global, environmental reasons: The vegan lifestyle is just cleaner for the environment. Buying local, organic produce keeps people in business and keeps my body feeling clean. I don't feel tired or weighed down when I eat vegan. Instead, I feel alive, awake, and I've been sleeping better like you wouldn't believe. My stress levels are down, too. And the food just tastes better. Everything I make and post on Instagram is vegan (save a few pieces of fish), and people oo and aw over how good it looks. Believe me, it all tastes amazing because it's fresh vegetables, simple grains (quinoa, rice noodles), and fresh fruits. And although I won't get into the horrors of the meat industry these days, it's obvious that avoiding meat has incredible environmental and policy impacts. Even in the kosher world we've discovered that animals are treated poorly, and I have one shochet friend who will only eat what he has raised and schechted as a result of his training. There are no guarantees that the meat you eat has been raised, fed, and killed according to the strictures of Jewish law, and I'd rather be safe than sorry when it comes to observing the halachot of meat. Feel free to read this article from Aish about Judaism and vegetarianism. Although I don't agree with a lot of what is said there about "radical" vegetarianism, I do think the article makes some good points and refefences. Being vegan is just simpler. I know that sounds counterintuitive, but it's not. I am able to be more conscious of what I put in my body and thus more able to appreciate the gift that HaShem has given me. It is that -- a gift. It's not a right. At the Shavuaton people marveled: So what do you eat? Not consuming meat or gluten or soy, people were perplexed what on earth a person like me eats. Once upon a time, people lived on real, clean food. That's what I do. The other great thing about a diet like this? You can eat a lot more food. I can sit down and snack on an entire bunch of roasted asparagus without feeling guilty. As for the gluten-free thing, that one is simple. Since 2005 I had been struggling with a lot of gastro issues. I tried cutting out dairy (that was hard and it took me years to get here), coffee (no dice), and then soy. Cutting out soy made a huge difference, but I was still having a lot of problems. During Passover of 2010 I got really, really sick over Passover. People suggested getting tested for Celiac, so I did. The blood test, like most, came back negative. My doctor advised me to take a bunch of fiber pills and see what happens. I was flabbergasted and told him that I wanted to do the intestinal scope -- the only real way to see what's going on. He said it was invasive. I said do it. He said no. So I took the advice of friends and gave up gluten. I kid you not, within the week, I felt 100 percent better. It was a no brainer for me after that: I gave up gluten and haven't looked back. It's easy to live without gluten, and anyone who tells you otherwise is a moron. We've been convinced that bread must be made from wheat and that the same goes for pizza crust and noodles and everything else under the sun. Did you know that traditional English crumpets were not made with wheat? Or that arepas -- a classic Latino pastry -- are traditionally made just with corn meal and no wheat? Most of what our ancestors ate that we'd call "bread" was produced using ancient grains like teff, not wheat. But wheat is cheap, so it became the norm. It's sort of like corn and soy -- they're mass produced in a disgusting way in the midwest, so we put them in everything because it's cheap and easy. I'm not going to get into all of the specifics of the evils of wheat, soy, and corn, because then you'll all think I drank the Kool-Aid that they serve in Boulder. But those of you who know me know that I'm big on research, finding lots of angles, and picking the one that is both logical and practical. A plant-based diet is a healthy diet. That's that. There are plenty of olympians and atheletes that perform on gluten-free or vegetarian diets. It can be done. People survived for thousands of years on a plant-based diet, because meat used to be a luxury. We now think of meat as a right. There is a reason that many Chasidic communities feel that eating meat on Shabbos is a must -- it used to be a luxury. Do I miss meat? No. Do I miss dairy? Only sometimes when I'm craving gelato or feta. Do I miss gluten? Definitely not. I live in a seasonal, plant-based world, and I couldn't be happier. 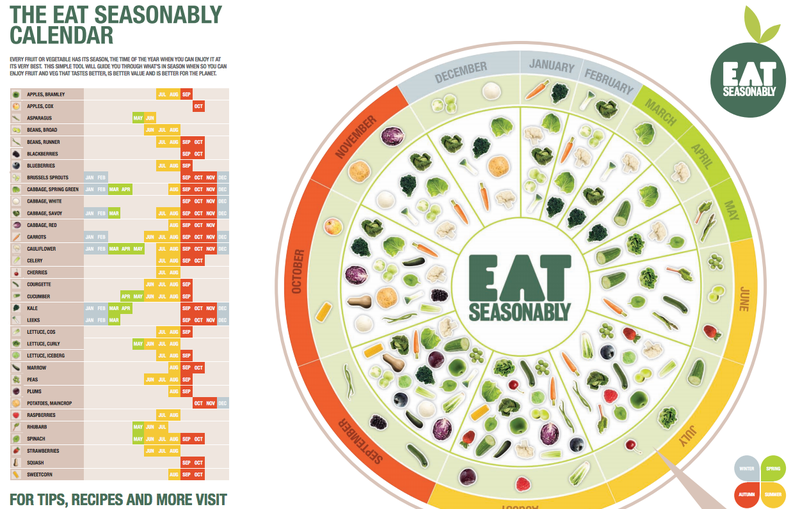 If you're intrigued and want to do what's both good for your body and good for the environment, I suggest checking out Eat Seasonably. When you eat what's in season, you're lowering your carbon footprint for the trekking of all those exotic fruits and vegetables you just can't live without, and you're also helping support local growers because their produce is what will end up in markets oftentimes. 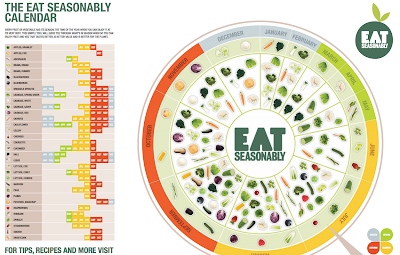 Use this Interactive Calendar to understand what is in season and plan accordingly. Your body and your planet will thank you.